The Wall was an unusual 3-wheeler with 2-seater body of sidecar appearance, described as a coachbuilt side-entrance sociable. It was powered by a 4/5hp single-cylinder or 6hp V-twin Precision engine mounted behind the front wheel and driving the rear axle by shaft. The company also made the Walcycar, a 4-wheeled cyclecar powered by an 8hp V-twin JAP engine, with 2-speed gearbox and shaft drive. 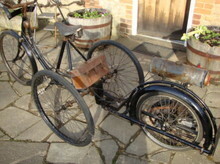 It was priced at 95 guineas while the 3 wheeler cost 90 or 97 guineas according to the engine used.